• Everything you put on your skin is absorbed into the bloodstream. • Many cosmetics contain chemicals that can have harmful side-effects. • One ingredient, ‘Parfum’ is a very vague term but often consists of several chemicals that can accumulate in body tissue. • Ninety-three per cent of women use lipstick BUT in their lifetimes they consume about 2lb of it through their mouths. • Lipstick colouring is often made from cochineal – crushed beetle-like insects. A long list of the best known cosmetics manufacturers still test their products on animals. If we used these cosmetics occasionally they wouldn’t cause many problems but the cumulative use of them over years of our lives means that the chemicals are embedded in our bodies and may be weakening our defence systems. The cumulative effect of many of these chemicals can cause premature ageing, disruption to hormones, allergic reactions, birth defects in babies and serious skin conditions and illnesses. Wednesday, March 14th is National No Smoking Day. Whether it’s a New Year’s resolution or this day it gives an incentive to cut it out. Smoking is SO expensive these days, plus Smoking Kills. There are 9 million smokers in the UK, the majority of whom are young people. That means that 19 per cent of smokers are men and 15 per cent are women. Two thirds of smokers took up the habit before the age of 18. 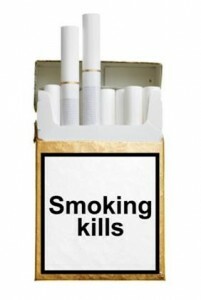 Every year 96,000 people in the UK die due to smoking related diseases. Half of all smokers will die because of their habit. One in seven 15 year olds smoke, with more girls smoking than boys. Smoking related diseases cost the NHS £2 billion a year. 80 per cent of deaths from lung cancer, emphysema, and bronchitis are directly attributable to smoking. In 1948 82 per cent of British men smoked, and 41 per cent of women. There are more people in the UK who used to smoke than those who currently maintain the habit. But the good news is that the body recovers reasonably quickly if you are young enough. 90% of lung cancer deaths are due to smoking. 80% of bronchitis and emphesema deaths are due to smoking. 1/3 of cancer deaths are due to smoking. •15 years: risk of heart attack falls to level of a permanent non-smoker. Around 70 per cent of adult smokers want to quit and 86 per cent have already tried but failed. The benefits are all too obvious, not just in health terms but also to the smokers’ wallet – a 20 a day smoker spends almost £1,700 every year on their habit. The good news is there is plenty of help at hand. Anyone can go to an NHS Stop Smoking clinic by referral from a GP, midwife or pharmacist (Local Stop Smoking Services, 0800 169 0169). You get to talk to an adviser and may be offered nicotine replacement therapy or Zyban, a prescription drug. Published trials claim that using nicotine replacement therapy to quit smoking doubles your chances compared with plain and simple willpower. You can see your doctor about NRT. •There is a wide variety of choice of NRT methods available on prescription including patches, gum, sprays, inhalers, tablets and lozenges. •They all provide lower levels of nicotine than cigarettes which is absorbed into the bloodstream and is enough to relieve craving and withdrawal symptoms. Available on prescription and over the counter at chemists. •Also included is a brief hypnotherapy session to reinforce the message. Those people who give up smoking as a result of Allen Carr sessions claim that they come out of the session with a completely changed view about the habit, and the majority don’t revert to smoking. For people who find that they don’t know what to do with their hands when they quit NicoBloc provides a chance to give up gradually. Drops of NicoBloc are put on each cigarette where it solidifies and blocks the amount of tar and nicotine inhaled. The gradual build-up starts with one drop in the first week, two drops the next week and so on. Eventually there is so little nicotine being inhaled and taken into the blood stream that the desire for smoking diminishes. It might be possible to get complementary therapies for quitting smoking on the NHS, at The Christie Hospital in Manchester, for instance where they use aromatherapy, reflexology, hypnotherapy and acupuncture as part of their smoking cessation programme. Acupuncture stimulates the body to release endorphins which help to induce a sense of calm and relaxation. •Needles are usually placed in the ear during a session – this is often called auricular acupuncture. •Sometimes one or more is left in to help people cope with cravings and withdrawal symptoms. A study of 6,000 smokers found that hypnosis was three times as successful as nicotine replacement therapy in helping people to give up. Sometimes available on the NHS but mostly you have to pay for these. The combination of hypnosis and NLP is often used to help people quit smoking as hypnosis works on the sub-conscious mind, and NLP provides ways of changing behaviour on a conscious level. A little chocolate every day.. Dark chocolate is good for you as flavonols, natural compounds in the cocoa bean, have neuro-protective effects. Therefore, they improve blood flow to the brain, especially the hippocampus that controls memory and becomes less efficient as we age*. Apparently flavonols also help to maintain heart health. Apparently the effect is more pronounced in women and can help those who have had a bad night’s sleep. A good excuse to eat some chocolate! Milk chocolate is not as high in cocoa but is much higher in sugar, so it does not have the same effect. But the health warning is that chocolate contains fat so it will also help you to gain weight, if you don’t stick to the moderate amount of two or three squares a day. And it contains caffeine so too much too late in the day can have the opposite effect and stop you sleeping. A 50g bar of dark chocolate (at least 70% cocoa) contains the same concentration of flavonols as two glasses of red wine, six apples or seven onions. In the past, research at Harvard Medical School showed that it can lower blood pressure by producing nitric oxide in the body, with benefits equal to that of aspirin. Similarly flavenols can improve the cardiovascular system and prevent heart disease, and deep vein thrombosis, which can be experienced when you fly. One of the other chemical compounds in chocolate is phenylethylamine, which is a stimulant similar to dopamine and adrenaline in the body. It is said to induce the feelings of falling in love, so maybe that’s why chocolate is so popular! 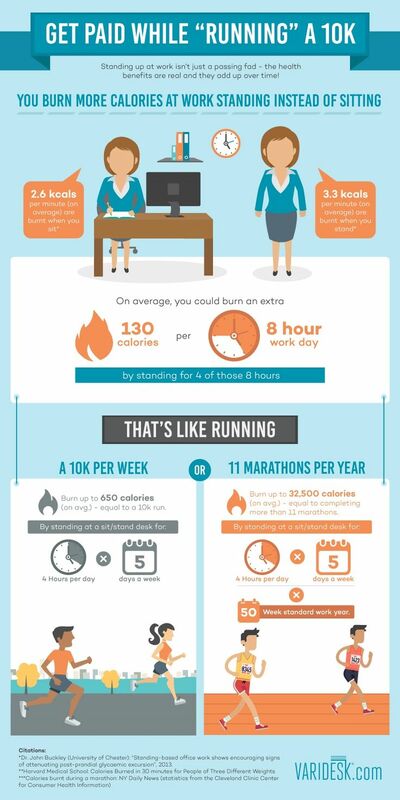 Stand at your desk all day and you burn an extra 50 calories per hour, 52,000 calories a year and it’s the same as running 20 marathons! You also can avoid back pain which is such a problem for computer users and boost your health. The way to do this is to have a standing desk and leading companies have installed them. Improves and prevents back pain.